Bring your best to battle by upgrading all of the available weapons in Splatoon 2. Nintendo Switch players making their way through Splatoon 2's single player campaign will eventually stumble across a series of alternate Hero weapons that serve as stand-ins for the game's traditional arsenal. Through persistence, players can eventually unlock these Hero weapons for use in the game's multiplayer mode as well as increase their stats in single-player mode through various upgrades. Keep reading to learn all of the items needed to upgrade damage, range, and other Hero weapon statistics in Splatoon 2. The first step toward upgrading weapons in Splatoon 2 is to unlock one of the upgrade-worthy weapons. The first of these will appear in the game's third lair, shortly after the battle with the Octo Oven, Splatoon 2's first boss. 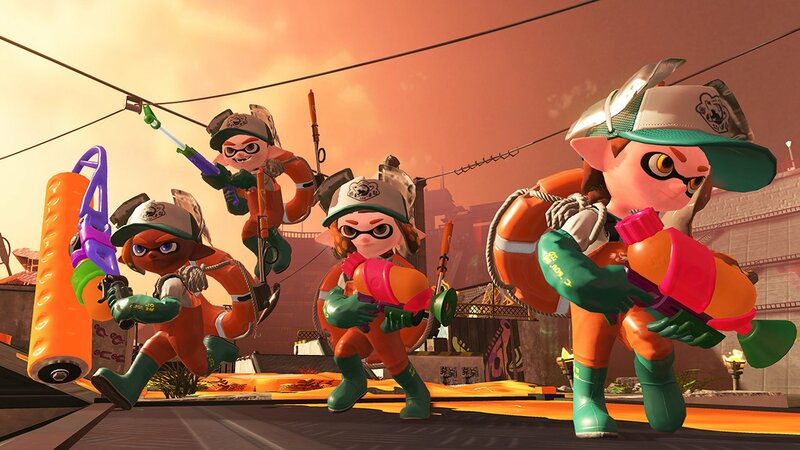 After the Octo Oven has been properly destroyed, players will gain access to the game's first Hero weapon as well as the Ammo Knights Enhancifier, a crucial tool needed to upgrade some of Sheldon's weapons. Aside from the Hero weapons themselves, the Ammo Knights Enhancifier is the most important part of weapon upgrades. Without it, players wouldn't be able to upgrade anything in their arsenal. Still, even with the Enhancifier in hand, players will need other items in order to upgrade weapon stats: these include Power Eggs and Sardinium. Power Eggs are the spherical items that Splatoon 2 players can find hiding throughout the game's various lairs. They are often given as post-lair rewards, and also appear from destroying crates, popping balloons, and defeating enemies. Sardinium, on the other hand, is a rarer item that players will have to seek out. There is generally one hidden Sardinium per lair, and there are also hidden Sardinium in places like Suction-Cup Lookout and Tentakeel Outpost. With both Power Eggs and Sardinium in hand, players will be ready to upgrade their weapons. Head over to Ammo Knights Enhancifier, press A to activate it, and scroll to the weapon to be upgraded. After that, press A to spend the Power Eggs and Sardinium and apply the upgrade. On the lookout for more great Splatoon 2 information? We've got loads of fresh guides, strategies, lists, and more featured over on Modojo's Splatoon 2 guide hub.